Just as the word “nerdy” seems to have lost much of its original meaning as “overly intellectual and obsessive,” some nerd comes along and diagrams badass lines from dozens of classic action movies, reclaiming it once more. 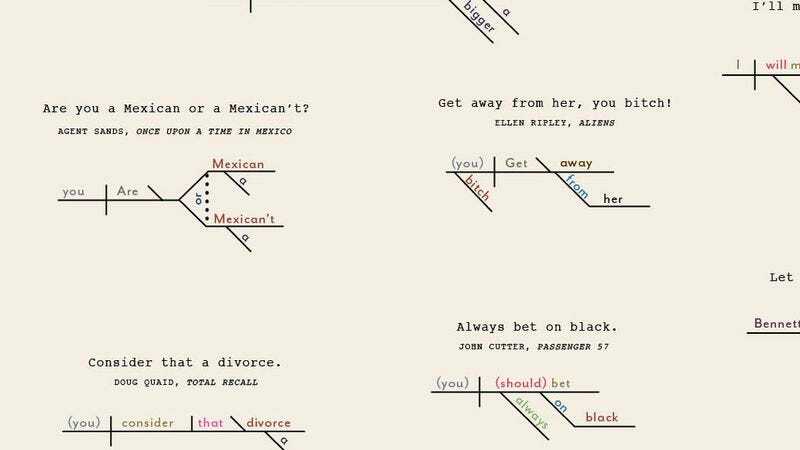 This powerful exercise in grammatical virility, A Diagrammatical Dissertation on Notable Lines of Cinematic Action is the kind of artifact sure to inspire either ripples of pleasure or palpitations in its readers—in other words, it’s the perfect conversation piece. As creator Pop Chart Lab explains cryptically, “It’s been said that the pen is mightier than the sword. But what if the sword is also a bazooka?” Pro tip: Try reading all of the implied words on the diagrams aloud to make lines of somber violence almost cheery: (You) go ahead (and) make my day!